Until recently, I’ve made very few lasagnas in my life. It always seems like a long process for an average, everyday pasta dish that appears on the menu at almost every red-sauce Italian restaurant. But this lasagna has changed my mind. I give credit to the absence of one of the most common ingredients in lasagna: ricotta cheese. I don’t have a particular problem with ricotta. The crumbly, almost grainy like texture doesn’t bother me like it does some people. I even thought I liked it in lasagna but that was before I tried replacing the ricotta with a basic béchamel sauce. The simple French sauce made of butter, flour, and milk (or cream) is often used as the base for many other sauces (like the cheesy sauce in baked mac & cheese). In this lasagna, the béchamel sauce adds an unexpected smooth creaminess to the dish without making it overwhelmingly rich. This lovely classic was adapted from John Clancy’s Cookbook, “John Clancy’s Favorite Recipes.” Another talented friend of my grandmother, John Clancy was a chef and restaurateur who like my grandmother, was mentored by James Beard. He later opened his own culinary school and authored a number of cookbooks. Although he was known for his fish and seafood recipes (and baking recipes in his inner circle), this lasagna recipe is exceptionally tasty. I did, however; make some modifications. The original recipe instructions state to cook the tomato sauce for 4 hours. Who has that kind of time?! I’m sure it might make a more flavorful sauce but a tasty one can be made in under 30 minutes and then allowed to simmer while the pasta and béchamel are prepared. Instead of a combination of ground veal, pork, and beef – which I’m sure is delicious – I decided to keep it simple by just using beef (ground turkey could also be used). And lastly, I added cheese! A sprinkle of parmesan on top was just not enough so I added both grated parmesan and mozzarella between each layer. Ricotta lover or not, this classic lasagna will quickly become your favorite and replace that tomato sauce-drenched version from the local mediocre Italian restaurant. In a large, heavy skillet, heat the oil until it is very hot. Add ground beef and brown, breaking up meat with a fork or spatula. Drain fat. Stir in onion and garlic and saute until translucent. Season with salt and pepper. Add tomato paste and cook a minute longer. Add the crushed tomatoes, oregano, dried basil (if using fresh, wait to add until right before building lasagna), and salt and pepper to taste. Bring to a boil then reduce to a simmer. Continue to simmer while preparing the bechamel and lasagna noodles. Heat the water for the lasagna noodles and cook according to package instructions while preparing the bechamel. A tablespoon of oil can be added to the water to help prevent the noodles from sticking. Cook until just slightly resilient to the bite. Place the light cream in a small saucepan. Heat cream until hot and set aside. Melt the butter in a heavy 1 quart saucepan, add the flour, and stir until smooth. Whisk in hot cream and place the saucepan over high heat, bringing the sauce to a boil and whisking constantly. When the sauce is very thick, lower the heat and cook for an additional 3 minutes. Add the salt, pepper, and nutmeg. Remove from heat and set aside. Spread a thin layer of the meat sauce on the bottom of a 9 x 12 x 3 inch casserole. Spread about 1/4 of the bechamel sauce on top. Add a 1/4 of the Parmesan and mozzarella. Add a layer of pasta on top. Repeat layering three more times, ending with meat sauce bechamel and cheese. Bake in a preheated oven until lasagna is bubbling hot, about 30 minutes. Remove from oven and allow to cool 5 minutes before serving. Adapted from “John Clancy’s Favorite Recipes,” by John Clancy. 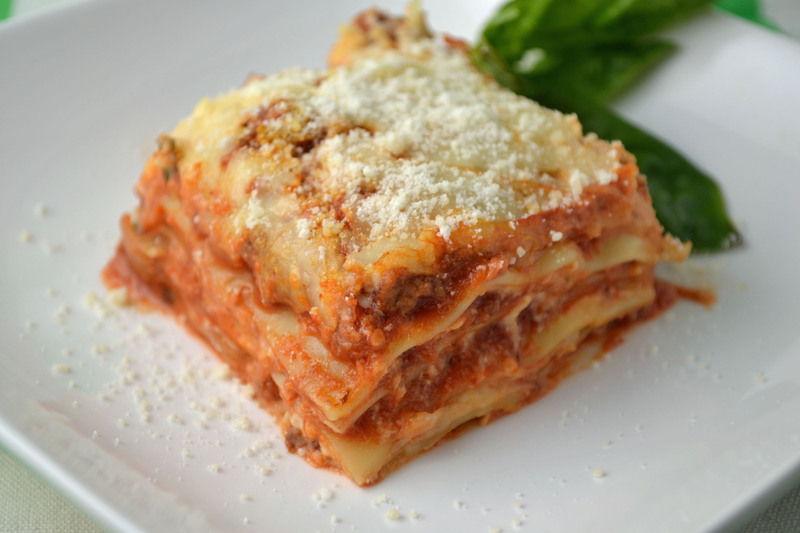 This Lasagna recipe & photo are making me might hungry!